MaintenX employees enjoy a sweet treat in celebration of National Ice Cream Month. MaintenX employees created their own frosty treats to celebrate July being National Ice Cream Month. From our Car Wash Fridays, barbeque cookouts, Sports Jersey days and more, MaintenX is always looking for new ways to make our workplace more exciting. MaintenX International brought a little sweetness to their employees’ day with an ice cream celebration Friday. MaintenX treated Tampa employees to a delicious create-your-own-sundae party in honor of July’s designation as National Ice Cream Month. 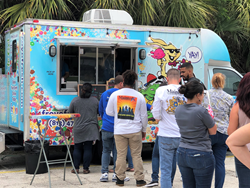 Tampa MaintenX employees enjoyed creating their perfect treat at the mobile ice cream truck, which offered ten flavors and over a dozen toppings to choose from. Having ice cream parties at work is just one of the great perks of being part of the MaintenX team. In addition to benefits like medical, dental and vision insurance, 401(k) options with 5 percent match and immediate vesting, paid vacations and holidays, MaintenX also offers unique onsite benefits like a gym, kitchen and bi-weekly sponsored lunches. MaintenX technicians enjoy special benefits like company vehicles, complimentary uniforms, overtime opportunities and the potential for signing bonuses. As one of the nation’s largest providers of preventative and reactive maintenance, MaintenX is committed to their employees from coast to coast. For more information about MaintenX, or to learn about joining the MaintenX team, visit http://www.maintenx.com.